Maurice Harry Reynard, aged 84, died on 31st March 2018 peacefully at home. Maurice was born in Thornton, to Winston and Nellie. One of his earliest memories was moving home in 1937 on Coronation Day. A day his Dad, an engineer at a mill in Allerton, could be sure to be off work for! An only child he was doted on by his parents and his two aunts Ethel and Bertha who were a fundamental part of his life until the day he died. Maurice grew up in Thornton and attended both Primary School then Thornton Grammar. His was a happy childhood, full of adventures with pals; often involving fireworks or building something on wheels design to go very fast down a steep hill! 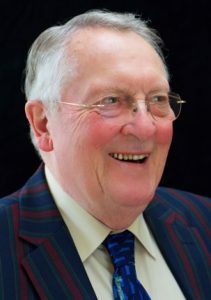 He was a regular attender at Thornton Methodist Church where he developed his strong Christian faith which gave him peace and guidance throughout his life. Once home he had to have a minor operation at Bradford Royal Infirmary and that is where he met the love of his life; Alice. They married in 1958. Children arrived in 1960 [Yvonne], 1961 [Paul] and 1967 [Dawn]. Maurice retired in 1990 but was not short of something to occupy him. He found many friends in Ionic Lodge, Baildon. He joined the video club and got involved in the Men’s Forum. His work for Baildon Methodist Church was another role he enjoyed and he undertook many duties over the years.